Reposting the story of Edith Cavell to accompany Wednesday’s post. 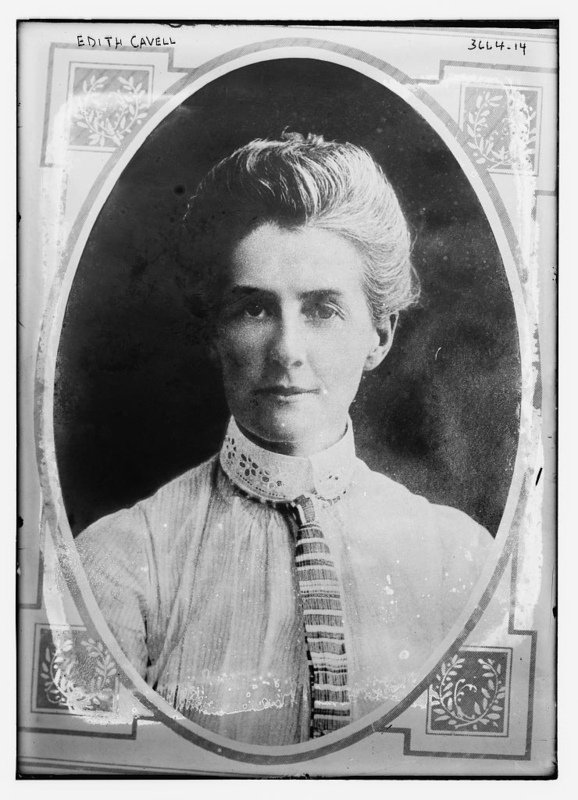 Edith Cavell was born near Norwich in 1865. As a 19-year-old she attended Laurel Court school, adjacent to Peterborough Cathedral, as a pupil / teacher. Her skill at languages led to her being recommended for a post as a governess in Brussels, Belgium. She stayed for five years, before returning to the UK to nurse her sick father. This led her to consider a change in career and she trained as a nurse at the London Hospital in 1896. In 1907, she returned to Brussels as the matron of a nursing school and when World War I broke out she continued to nurse the sick at the hospitals attached to the school, even when Belgium was occupied by the Germans. She became involved in the resistance movement, helping Allied soldiers escape from occupied Belgium to neutral Holland. 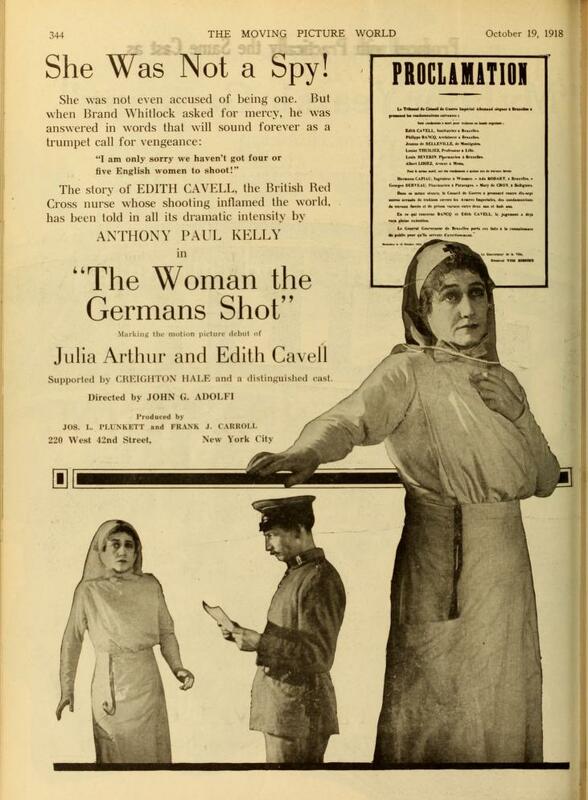 In August 1915, she was arrested along with a number of others and after being interrogated and imprisoned for 10 weeks, she was executed on 12 October and buried in an unmarked grave. This harsh treatment of a woman and a nurse received multinational condemnation. 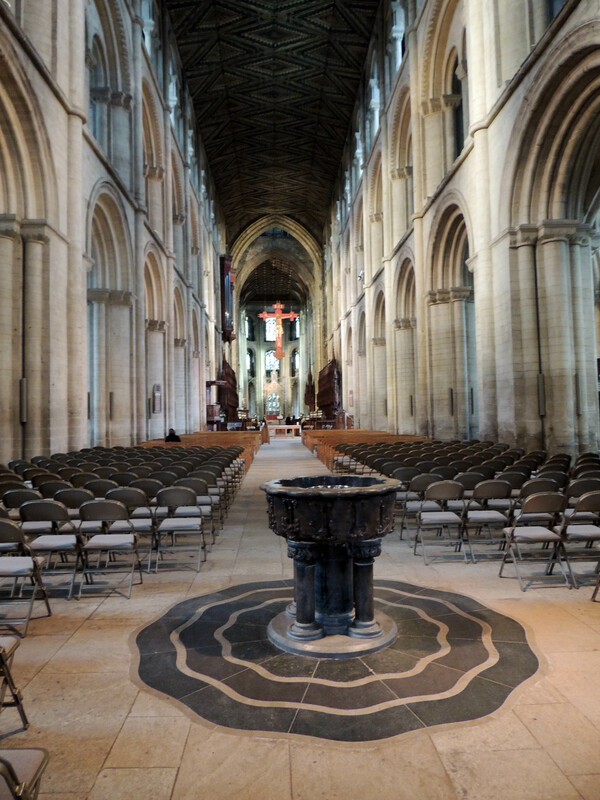 In 1919, following the end of the war, her body was exhumed and reburied in Norwich Cathedral. 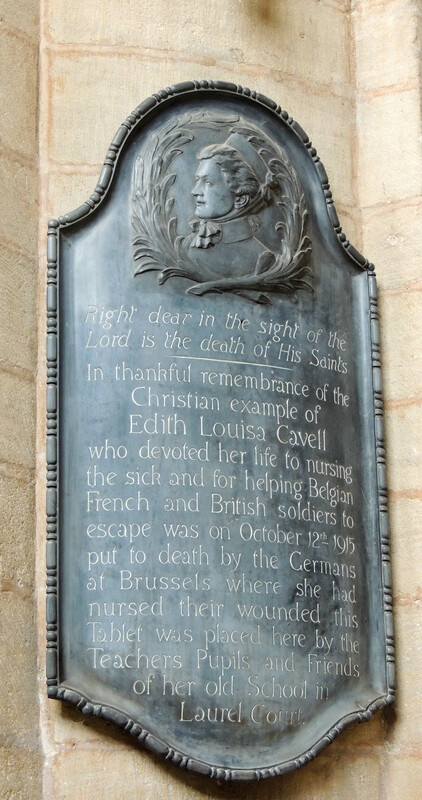 The memorial to Edith Cavell in Peterborough Cathedral was set up by students and teachers of Laurel Court school. 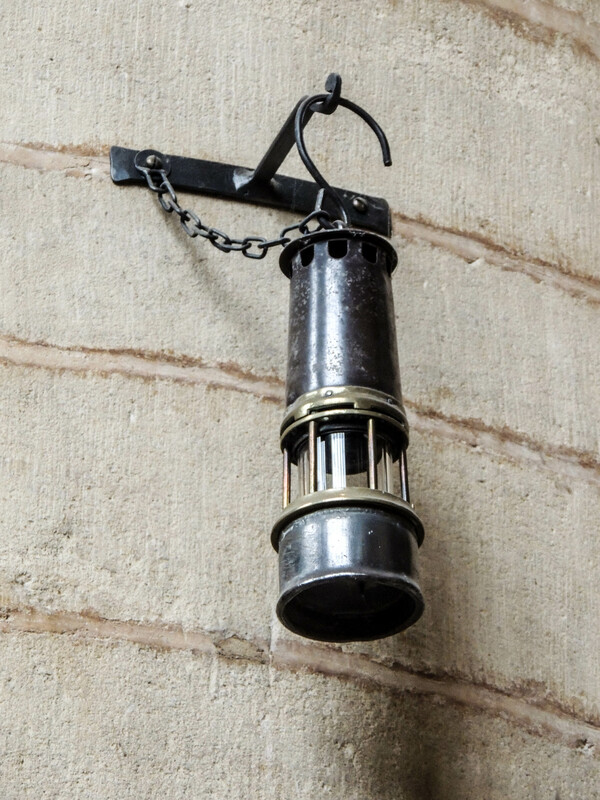 In 2009, Princess Elizabeth de Croy, whose grandparents had run the escape network in Belgium, presented the cathedral with a lamp used by the resistance for signalling night-time meetings during World War I. It hangs above the Cavell memorial. Neville Place is a large house in the middle of Peterborough not far from the Cathedral. The original Tudor House was built in 1536 on this site by Humphrey Orme, a courtier of Henry VIII. In 1816 the Orme family sold it to Thomas Coke, a merchant, and in 1856 it became the home of Peterborough Infirmary, being enlarged in 1897 and again in 1902. In 1928 the infirmary moved away and it became a Museum. It is still a museum today and has displays on various aspects of local history. A wonderful collection of craft items made by internees at Norman Cross Camp. The prisoners made these from wood and animal bone and sold them to the locals to make money to spend in the prison stores. Norman Cross was a prisoner of war camp during the Napoleonic war. Prior to its construction prisoners had been held on old ships (Prison Hulks) and conditions were not good. So the government set out to improve things by building prisoner camps on land. Initially, the plan worked well and the conditions were far better than on a hulk. However, as the war drew on and the number of prisoners increased the conditions got worse and over a thousand prisoners were killed by an outbreak of Typhus in 1800. It is recorded that in the years of its operation (1796-1816) 1770 prisoners died, although some argue that many deaths were not recorded. It was demolished in 1816 and only the governers House remains standing. 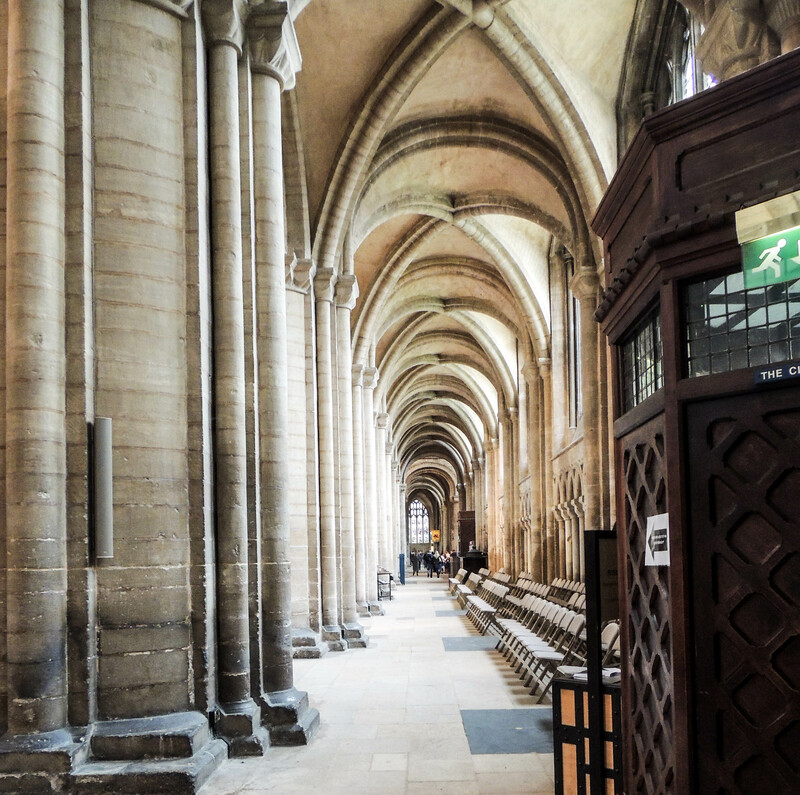 In the 11th century, the Abbey built a church for the townspeople on land to the east of the Cathedral precinct. 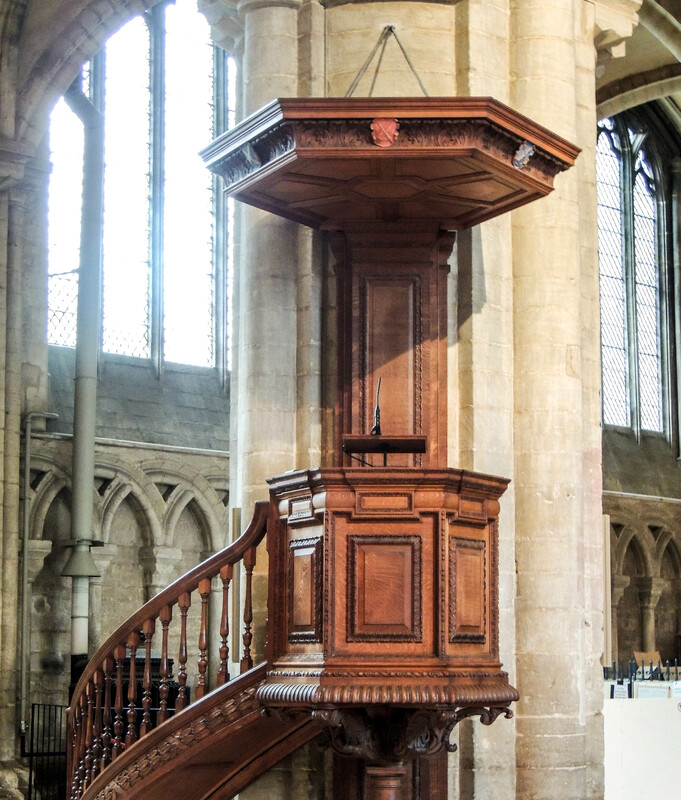 However, this site was liable to frequent floods and so in the 15th century, the church was moved to its current site of the west of the Market. The new Church opened in 1407 and was partially built using materials from the original building. It 1651 it, like the Cathedral, was damaged by Parliamentarian forces. The parish records show that in 1665-7, the rector buried 462 people who had died from the plague (out of a town’s population of around 3000). The tower was to prove troublesome and in 1820 the original spire was removed as builders felt it to be unsafe, During a gale in 1881 part of the Tower broke away and crashed down through the roof of the Church. 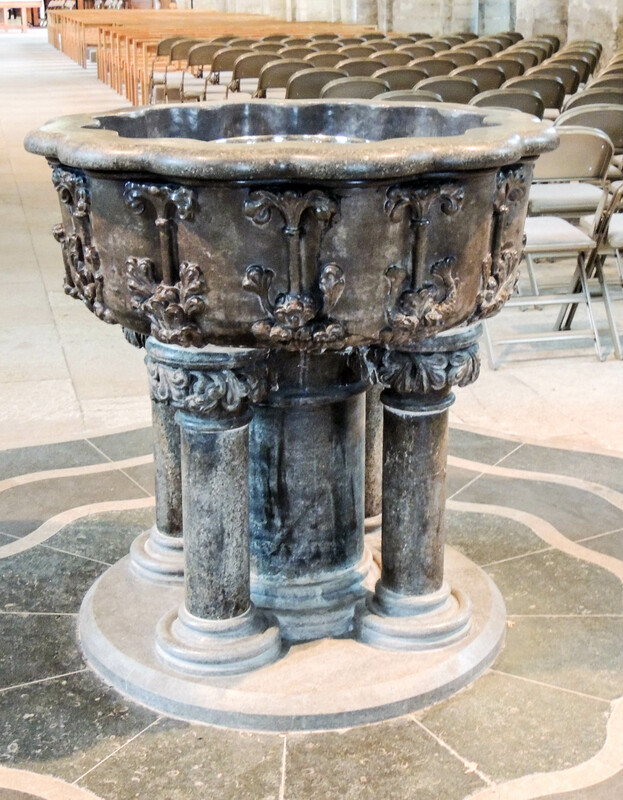 The church contains a number of original features including the 15th-century font. It also contains some fine stained glass windows. The entrance to the Bishop’s Palace. the room above the entrance is known as Knight’s chamber as it is reputed to be accommodation for Knights hosted by the Abbey on the order of the King. The Beckett Chapel, built around 1320 to replace a building of 1170 which housed relics from St Thomas Beckett. In 1541 following the dissolution of the Abbey it became part of King’s school and in 1885 Peterborough Museum. It is now the tea room for visitors to the Cathedral. Robert Scarlett was born in 1496 and became the gravedigger at Peterborough Cathedral. He lived to be 96 years old and may have been the model on whom Shakespeare based the character of the gravedigger in ‘Hamlet’. Near to the end of his life, he claimed to have buried 3 Queens – Katherine of Aragon, Mary of Scotland and his own wife Margaret. 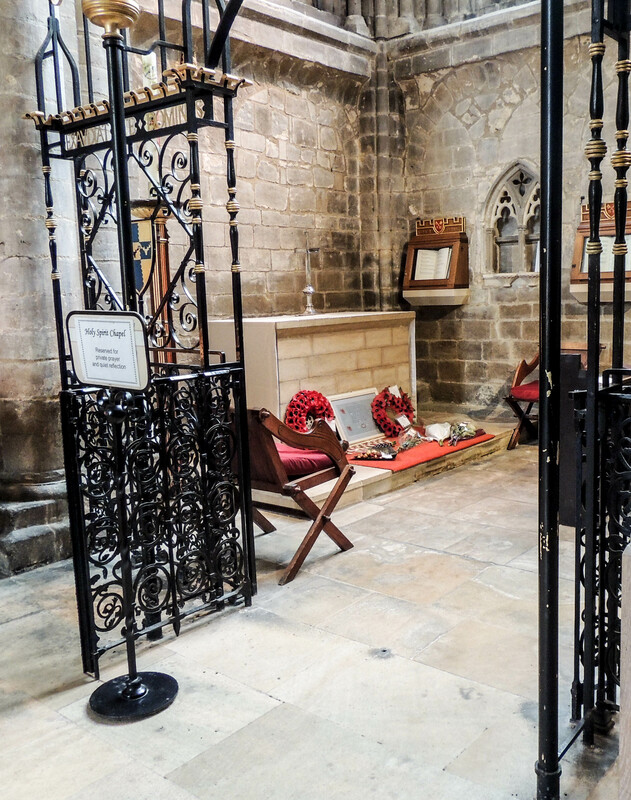 He was held in such esteem by the people of the town and the Cathedral that when he died he was buried inside the Cathedral, an honour granted to few people of his social status. This tower was added so that a monk could watch the relic chapel below – a sort of medieval security guard. 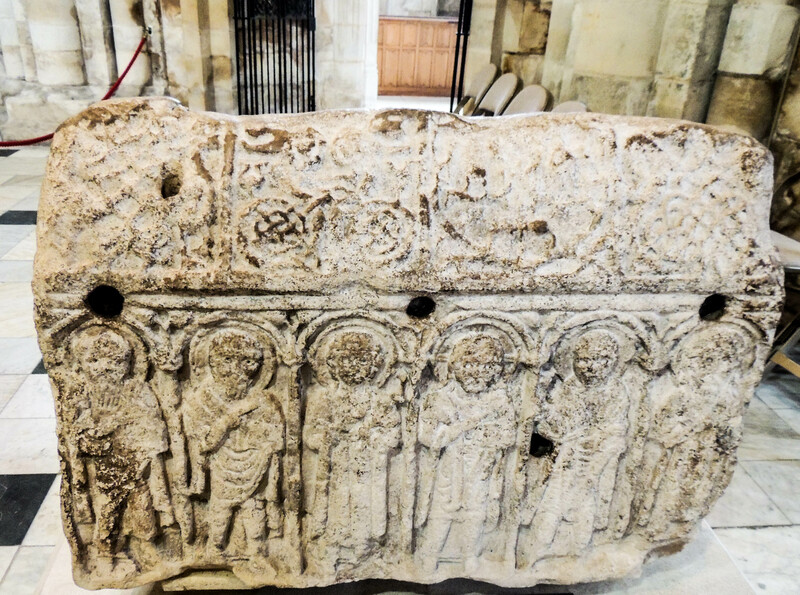 Tomb of John Chambers – last Abbot of the monastery and first Bishop of Peterborough, one of the few abbots to keep a post following the dissolution of the monasteries. 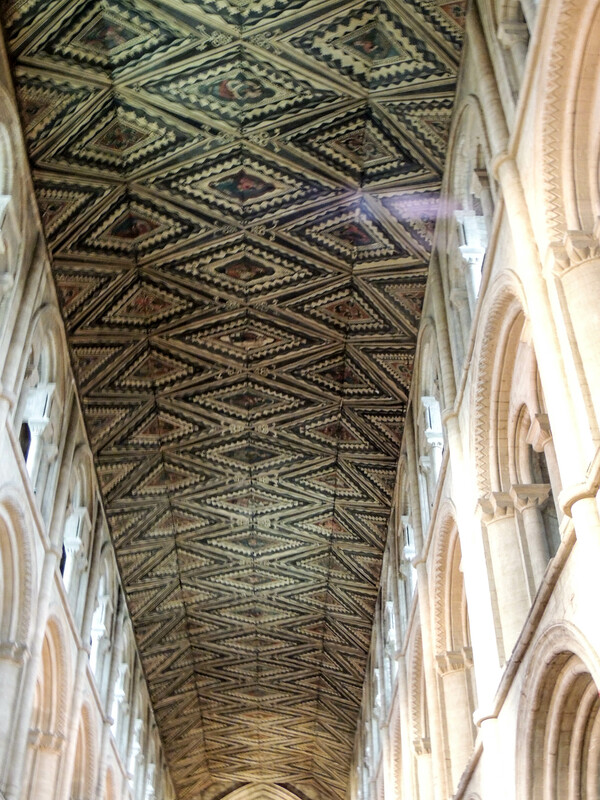 This is the oldest part of the Cathedral, where work started in 1118. 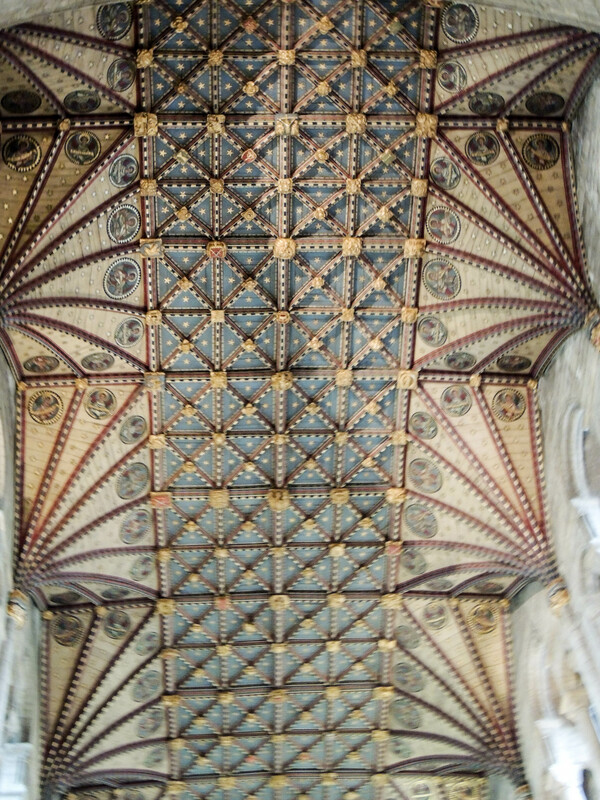 19th-century copy of medieval ceiling. Original had been badly damaged by Parliamentarian musket practice during the civil war. 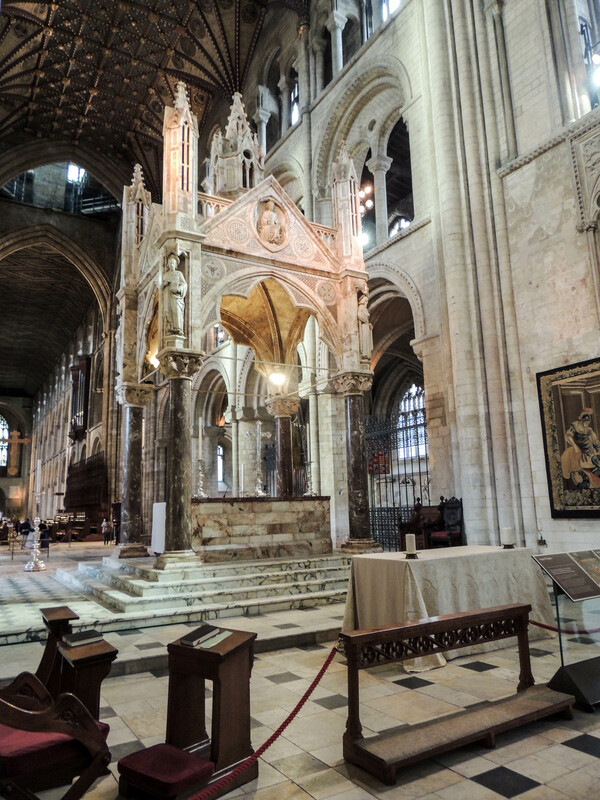 At each side of the choir are the two most famous tombs in the Cathedral. The first is of Queen Catherine of Aragon, first wife of Henry VIII, who died in nearby Kimbolton Castle in January 1536. 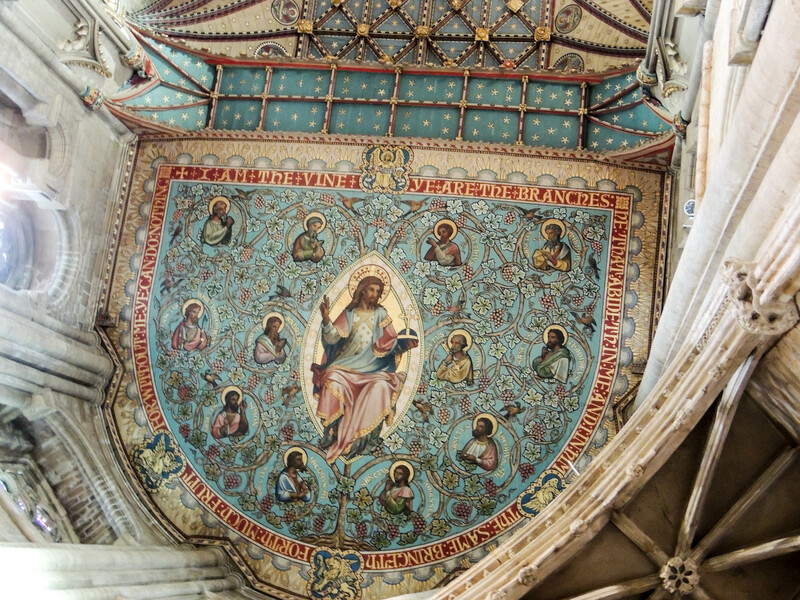 The flag of Aragon flies over her tomb and many Spanish pilgrims make their way to Peterborough to see where the Spanish Queen of England is buried. The second tomb is no longer occupied. It was the tomb of Queen Mary of Scotland, who was executed at Fotheringhay Castle in 1581, having been found guilty of treason against the English monarch, Elizabeth I by being involved in plots to overthrow the English Monarchy. 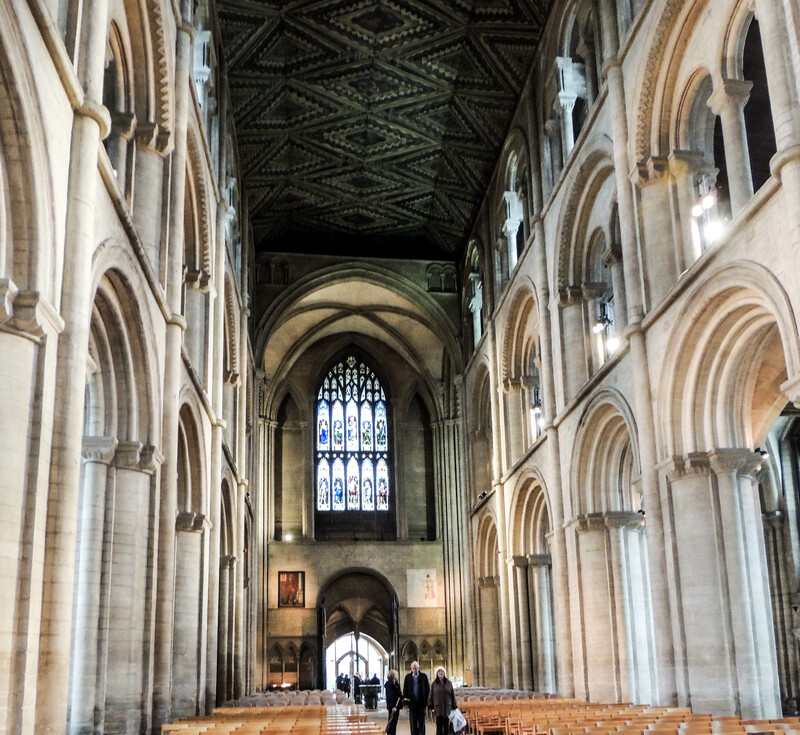 She was buried in Peterborough, but when in 1612, Mary’s son, James succeeded Elizabeth to the English throne, he had his Mother’s remains brought to London and reburied in Westminster Abbey. Another interesting monument is that to the Orme family. When Parliamentary soldiers used the Cathedral as a stables during the civil war, they also passed their time by defacing the monuments. 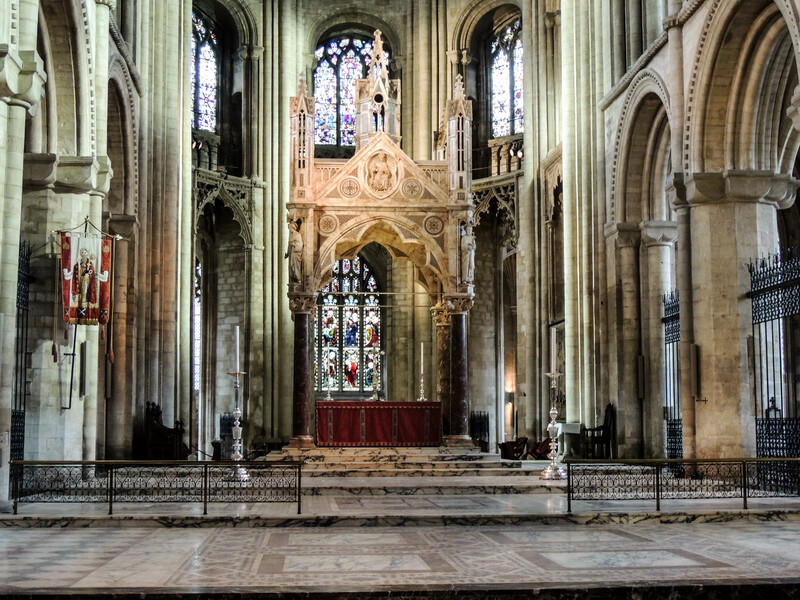 Following the restoration of the monarchy, the cathedral authorities sought to restore the damaged monuments. However, the Orme family asked that this monument be left as a reminder of what had happened.